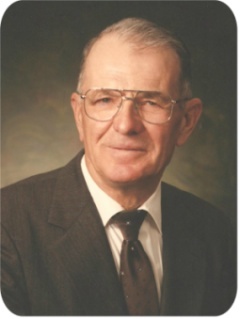 Eugene Albert Gaer (January 3, 2010) | Burmeister-Johannsen Funeral Home, Inc.
Eugene Albert Gaer, the only child of Lloyd Albert and Grace Laura (Comstock) Gaer, was born on October 16, 1921, in Polk Township, near Kirkman, Iowa. He attended Polk #9 country school through the eighth grade and then helped his father on the farm. On October 6, 1946, in Harlan, Iowa, Gene married Marjorie Ann Welch. Gene was a hard worker who drove the school bus for Irwin/Kirkman, worked for LeRoy Anastasi Plumbing and Heating, and later, Wigness Machine Shop. For 29 years, he drove a road grader for Shelby County. Gene was a member of the Redline Church of Christ. He loved his family and fixing old bikes for his grandkids. Gene enjoyed watching sports, bowling, and pitching horseshoes. He also enjoyed helping his son, Tom, on building projects. Gene A. Gaer died on Sunday, January 3, 2010, at his home in Harlan, Iowa, at the age of 88 years, 2 months, and 18 days. Gene was preceded in death by his parents; his wife, Marjorie Gaer, on September 21, 1985; and one daughter, Sharon Morton. He is survived by one son, Tom (Dianna) Gaer of Irwin, Iowa; one son-in-law, Michael Morton of Newton, Kansas; five grandchildren; 11 great-grandchildren; and other relatives and friends. Funeral services were held on Saturday, January 9, 2010, at the Burmeister-Johannsen Funeral Home in Harlan, Iowa, with Roy North of the Redline Church of Christ officiating. Serving as casket bearers were Greg Gaer, David Sears, Alan Morton, Hal Youngkin, Justin Pearce, and Andrew Morton. Burial was in the Redline Cemetery in Rural Shelby County, Iowa. Memorials may be made to Myrtue Medical Center Hospice. The Burmeister-Johannsen Funeral Home, Inc., in Harlan was in charge of the arrangements. Condolences may be left online at www.burmeisterjohannsen.com. Joy and I are so sorry for your loss. Thinking of Gene will always give me fond thoughts to remember. I would have liked to come for the funeral, but the weather will not allow. I will be thinking of you and yours and keeping all in my prayers. Blessings to all of you. We have sorry to hear of the passing of Gene. For many years we have been his next door neighbor and have lots of fond memories of him. We give our condolences to you in this hard time. Tom, Dianna, Greg, Tanya, and Karissa~ We’re so sorry to hear of Gene’s passing and we extend our sincere sympathy to you all. We love you guys! God bless you and help you through this difficult time. Please accept our condolences upon Gene’s death. We will continue to keep you all in our prayers and remember Gene as he affected our lives for good.